LAS VEGAS, NEV. — The Ogden, a 25-story condominium tower in the heart of downtown Las Vegas at 150 Las Vegas Blvd. North, has received approval from Fannie Mae to offer financing options as low as 3 percent down for eligible primary home buyers. The Ogden is the only condominium building in Las Vegas, and the first since 2008, to obtain Fannie Mae PERS (Project Eligibility Review Service) final project approval. In addition to Fannie Mae, The Ogden also offers buyers VA guaranteed mortgages and in January is expected to offer FHA financing options –culminating in a triumvirate of mortgage financing options not typically available at a single property. With more than 60 percent of residences sold at The Ogden and Fannie Mae financing now available, qualified buyers now have the opportunity to finance up to 97 percent of their purchase for first time buyers, 95 percent for primary residences, 10 percent for second homes. Investor buyers can purchase with as low as 25 percent down. Previously, condo mortgages were typically adjustable rate mortgages, so with Fannie Mae approvals, Ogden buyers can now enjoy today’s low rates on 30- and 15-year fixed-rate mortgages. According to Uri Vaknin, a partner at KRE Capital LLC, whose company, in partnership with Dune Real Estate Partners and Northcap, purchased The Ogden in 2013 as DK Las Vegas, Fannie Mae approval could not have come at a more perfect time considering the impending interests rate increases from the Federal Reserve. Fannie Mae approval is not just a significant milestone for the Ogden and the Federal Savings Bank team, it’s important to the Las Vegas community as a whole. According to Rodriguez, qualifying for Fannie Mae approval requires a track record of sales success, a strong Homeowners Association with reserves, credible ownership that is proven in its financial and management commitment to the property, a low percentage of investor-rented condos, lack of foreclosures and a strategic sales and marketing plan. “These factors and others are carefully reviewed to ensure qualifying properties are well positioned for continued success with the expansion of financing options,” he said. Offering more than 17 different spacious and modern floor plans on 21 floors, homes at The Ogden range from a one-bedroom, 815-square-foot residence with prices starting in the mid-$200s to a three-bedroom plus den 2,044-square-foot home starting in the low $600s. Residences feature a modern design, private balconies and expansive views of Downtown Las Vegas, The Strip and the mountains that frame the valley. Single-story, open floor plans offer flex spaces that can serve as a home office, den or yoga room, extra bedrooms for accommodating multi-generational family and guests, and spacious windows that fill interiors with natural light. A $2 million re-design includes luxury amenities such as a rooftop pool, 16th Floor Clubhouse, Sky Deck, fitness studio, pet park and casual work spaces. The Ogden’s luxury lifestyle and prime downtown location attracts Millennials, empty nesters and retirees. With all the benefits of a single-family home without the upkeep, The Ogden is within walking distance of more than 150 restaurants, bars and eateries; nightlife; and shopping, entertainment and cultural attractions. It is minutes from the world-famous Las Vegas Strip. 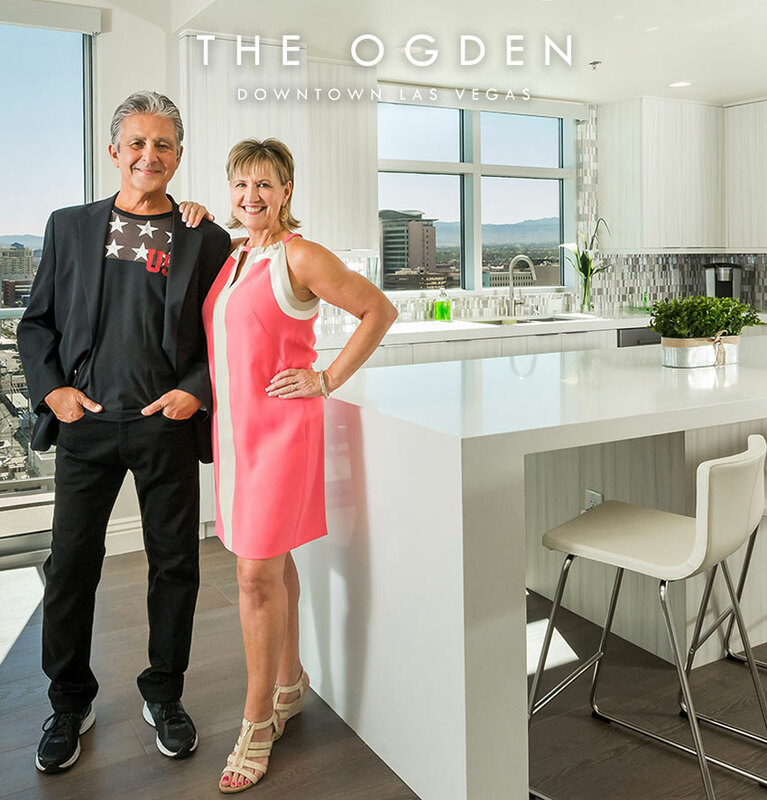 For more information, visit The Ogden’s onsite sales center at 150 Las Vegas Blvd. N. or online at Ogdenlv.com, or call 702-478-4700. The Ogden Las Vegas is a 25-story condominium tower located in the heart of Downtown Las Vegas, offering residents immediate access to the scores of restaurants, bars, coffee shops, museums, boutiques and entertainment destinations that create downtown’s rich urban lifestyle. Homes at The Ogden range from a one-bedrooms starting from the mid $200s to a three-bedroom plus den 2,044-square-foot home from the low $600s. Residences feature a modern design aesthetic in keeping with the architecture and the lifestyle vibe, private balconies and expansive views of downtown Las Vegas, The Strip and the mountains that frame the valley. For more information, visit The Ogden’s onsite sales center at 150 Las Vegas Blvd. N. or online at Ogdenlv.com. Or call 702-478-4700.